The Page Police Department has appointed Officer Bill Schuldies to the position of School Resource Officer for the Page Unified School District. An Intergovernmental Agreement between the Page Police Department and the Page Unified School District was approved by Page City Council and PUSD Board, authorizing the appointment of a School Resource Officer (SRO). The mission of the SRO program is to contribute to an orderly, purposeful atmosphere, which promotes the feeling of safety conductive to teaching and learning on school campuses in the City of Page. Officer Schuldies began his career in law enforcement in 1997 with the Page Police Department. 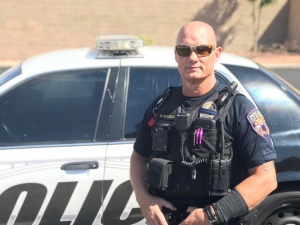 He transferred to the Sierra Vista Police Department in 1998 and served as SRO for Buena High School from 2004 to 2007. Officer Schuldies returned to the Page Police Department in 2011, and looks forward to his newest assignment as School Resource Officer for the Page Unified School District. The Page Police Department is committed to working with the Page Unified School District to provide a safe environment for our teachers and students. Chief Frank Balkcom, Sr. would like to thank the PUSD Board and Page City Council for their partnership on getting this agreement done on behalf of our students.